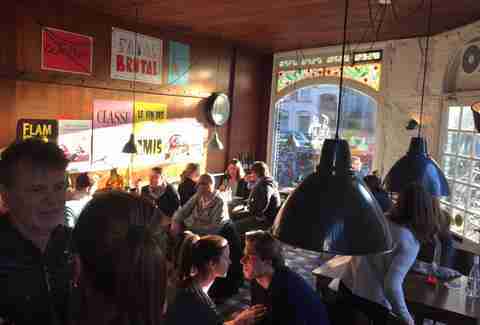 We already know Amsterdam is beer town. And gin town. (That’s jenever to you, sir.) And a you-know-what town. But believe it or not, the Amsterdammers do love their wine as well. Crazy, right? 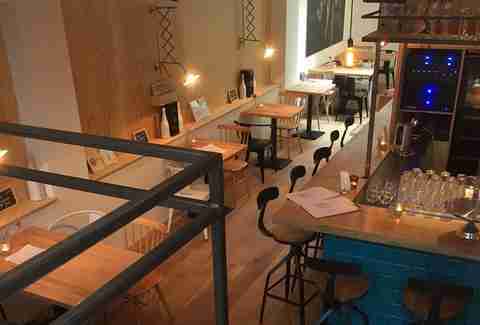 Well, it's true, and here are the 10 best places in town to get it, including four newbies. This new wine spot is full of modern South European style, with black-and-white photography from 80 years ago playing backdrop to furniture and flooring in black metal and tastefully beaten wood, and leafy plants adding verdant accents. The menu is all Italian. 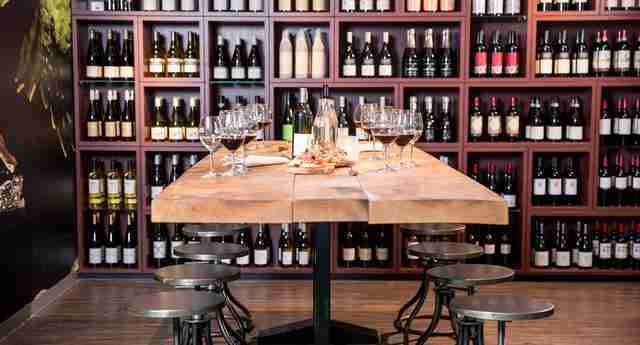 The 19 wines, served by the glass or bottle, include tried and trues like prosecco and Valpolicella, but also some less-common options for the vino explorers. There’s also an alcohol-free spumante, coffee, and plenty of food. Italian, of course. This place is new, too, and its focus is all-natural fermented grape stuff from France, Italy, and Spain, with no sulfites or other additives. But don’t expect it to be more expensive (wines start at €4.80/glass) -- just more wholesome. Inside, solid wood and haphazardly bricked white walls next to a multi-hued tile floor and partially stained-glass window warm the look of the otherwise basic furniture. The only art on the walls (thankfully) are posters from the vineyards behind the bar’s earthy pours. Next to the wines, you can order nibbles (including savory pies) that come from the neighbors. It's also got a natural beer on tap. 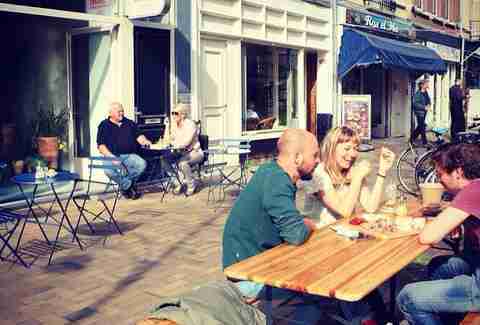 Bonus: it's got a sunny terrace, too! 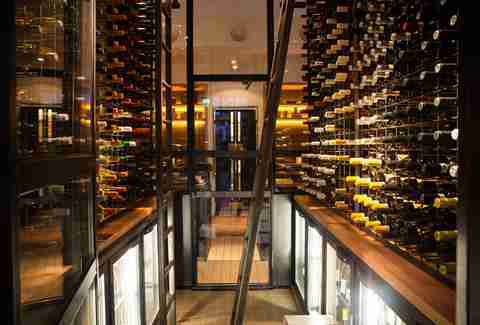 This ultra-chic and dimly lit cave of wines is lined by bottles in the grips of an Enomatic conservation system behind glass. 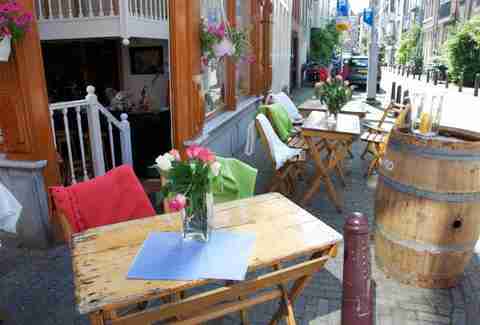 Bubbles is one of the stalwarts of the Amsterdam wine scene. 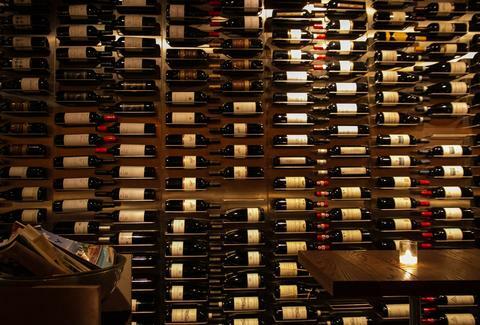 That might have something to do with the more than 50 different wines it offers by the glass. You can thank the aforementioned Enomatic system for that, which lets the bar keep open bottles longer by regulating the temperature and oxygen content of each. It also serves some of the city’s most elegant bar bites. Think Gorgonzola-hazelnut cream-dried fig bruschettas (€8). We’ve previously highlighted this sausage-friendly deli-like spot for its brunch, but it should be no surprise it's big in the wine game, too. It’s right in the name. It's got 17 to try by the glass, and a bunch more by the bottle, plus other drinks. The next new bar on the list keeps the décor simple with a patterned tile floor, steel-lined doors, and lots of light wood. There’s plenty of room over two levels to pull up one of the deliberately mismatched chairs and enjoy the almost 40 by-the-glass options, menu of snacks, and small dishes like bread and spreads or roasted quail with red lentils. The wine comes mostly from Western Europe. With glasses starting at €3.50, the aim is affordability. Looking for smaller samples? You can order by the half glass, too. There are even alcohol-free versions if you need them. 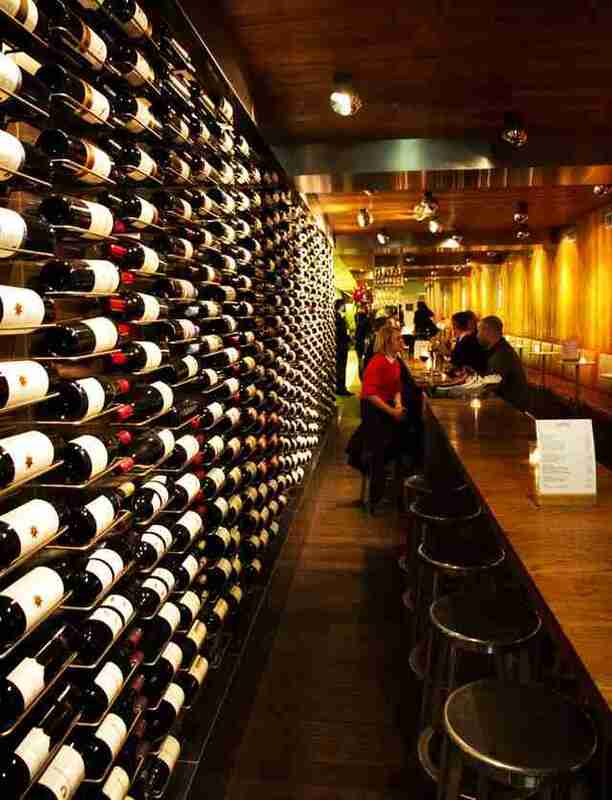 Vyne ties Bubbles & Wines as the city’s most popular and well-known wine bar. Don’t come here hungry Mon-Weds, because the food menu is rather limited then. But it has enough wines (75+ by the glass) to slake a mighty thirst. All the wine flights, comprised of three (mystery) half glasses, have the same price: €13. Though most of the wines are from the usual places, Vyne has a couple surprises, too. Another rather new wine spot (can we hope for a trend? 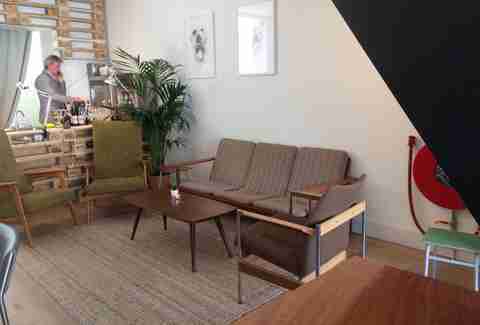 ), Paulus has an airy, Instagram-ready interior that looks like the most stylish GDR-era living room you’ve ever stepped foot in. The snacks are basic; all the emphasis is on the booze. The fermented grape juice contains a few surprises, like an almost-Champagne-style sparkling wine from Luxembourg. It only comes by the bottle, so you’ll have to splurge on the whole thing. Boo hoo. There are 15 other vinos you can get by the glass, though. The graphic menu makes it easy to figure out the origins and grapes of the 25+ wines by the glass (and more by the bottle) available here. The offerings veer more toward classics than adventurous options, but there are some great deals here, like a summery Cinsault rosé from the criminally undervalued Languedoc region. This hotel bar, with adjacent restaurant, is the perfect spot to drag your non-wine-drinking friends, as there are also local beers and cocktails aplenty. The shop also sells bottles to go. There’s more love for the Italian grape in the Jordaan, with antipasti to match. 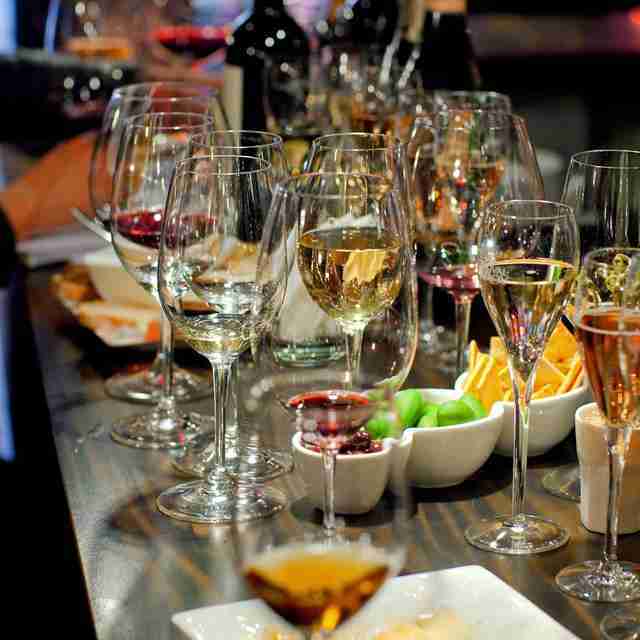 (Wino tip: Italian wine is meant to be paired with food. So, eatin’s not cheatin’ here.) Pleasant as the interior is, given the location, this is one spot where it’s even cozier on the terrace. (As long as the neighbors aren’t kicking up a fuss.) The menu is a tour around Italy... which means many in-the-know oenophiles heading straight for the currently popular Piedmont stuff. So, here, let us point you in the direction of this lightly oaked, mineral and floral number, the Roero Arneis Sito Dei Fossili. There’s a spacious modern area inside, but the waterside terrace is massive and covered with nothing but sun. 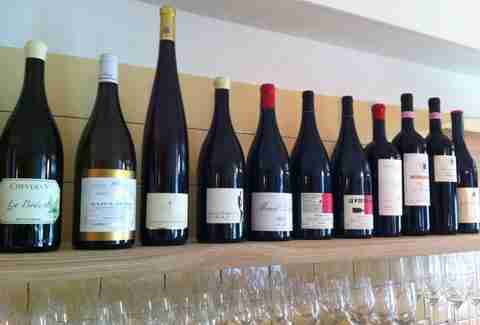 The wines, almost 40 of them by the glass, mostly come from Italy, France, Spain, Austria, Portugal, and Hungary. In addition to the two beverages mentioned in the venue’s name, there’s also a full Mediterranean menu featuring stuff like boeuf bourguignon with truffle or salmon with black rice and broccoli. BTW, it's got a no-cash policy, so bring a card.